This article will walk you through the most common ways to make money blogging. 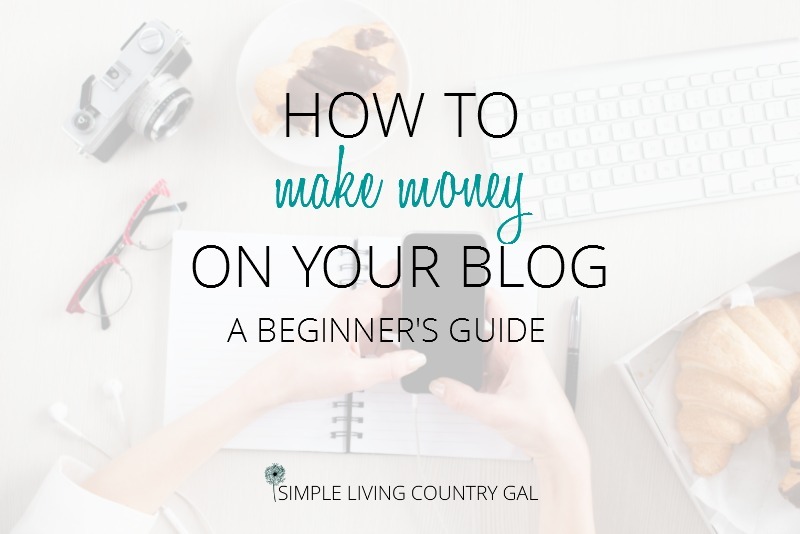 Now even though I just skim over these tips you will be able to understand exactly how each money maker works and what you need to do to implement them on your own blog. When my real life people find out I have a blog their first question usually is…. It just amazes me that even today with millions upon millions of blogs out there in cyber land most people have no idea what one is. And you make money doing that? This is my favorite question to answer. Why yes, I do, make money blogging. To be honest I used to feel, well, “icky” using ads and affiliates. But then I thought about it. I work 40-50 hours a week on my blog. I want it to be good, I want it to help people, and yes I want it to make our family money. After all, in order to call it a job I need to get paid. I remember the day I realized after blogging just 10 months I was able to quit my 2nd job. I can’t even tell you how good that felt. Then after blogging a little over a year, I was able to quit my first job. Today I am happy to say I am a full-time blogger. (I just love saying that out loud!) I set my own rules, make my own hours and earn a living. Now, please don’t get me wrong. I am NOT one of those bloggers bringing in $40 thousand a month. Nope, I am just not there yet. I am in a tricky niche. That means I write about a subject where it is not the easiest to make money. Or so, that is what I told myself. The problem was I wasn’t trying to make money the right way. I was chasing everyone else’s success rather than creating my own. This post is all about how YOU can create your own success and find the best way to make money. A way that fits your personality, your comfort zone, and your readers. Don’t just throw everything I tell you up there and hope it sticks. Pick and choose what you are most comfortable with because if you are comfortable you will be authentic. And let’s face it, authenticity sells. These are the most common ways to make money blogging. Promoting products from other bloggers. Moneymaker #1 Placing advertisements on your blog. There are many companies out there that deal with ad placement. Each company has its own requirements, such as page views and type of blog. When you are first starting out, your page views will be relatively small, so your best bet will be AdSense. AdSense is an advertising placement program that is run by Google. This is a great way to get your feet wet with ad income. Since AdSense has no minimum page view requirement, just about every new blogger begins with them. When you sign up AdSense will place several ads on your blog. They will suggest placement of these ads in zones or high traffic areas but you will have the final say. The best place to put ads are at the top (your header) on the side (your sidebar) and in a post (in content). These are your money maker places so take advantage of them. The money you make depends on CPM which stands for “cost per 1000 impressions,” or what an ad company is willing to pay for those 1000 impressions in one ad zone. So as you can see the more page views you have the more money you can make. Page views = impressions. Impressions = money. Please note that before you can get a payout from AdSense you must first meet the $100 threshold. This can take a bit at first, but before you know it you will be making money! Setting up Adsense can be a little tricky. Luckily there are quite a few video tutorials that will walk you through it. You can find one here to get started. How to set up Google AdSense. Once your pageviews begin to grow so will your ad revenue options. Mediavine is an amazing company that will work with you once you have at least 25K pageviews a month. Adthrive is another awesome company that will work with you once your page views increase to 100K a month. With each step up to another ad company, you will see your passive income soar to new heights. Moneymaker #2 Promoting products from companies or other bloggers. This is known as Affiliate Marketing and is a great way to make money blogging. Tip: There is so much information on affiliate marketing there is just no way to cover it all in a blog post. I will just point out the highlights so you have an idea of how it all works. Affiliate marketing is a way to make money by promoting products or services in exchange for a commission from any sales that may result. Commissions can be relatively high compared to that of ad companies ranging from 4% up to 50% of the cost of the product or service. This is a great way to pick and choose products you know, use and love and promote them to your readers. The most common affiliate company is Amazon. Amazon is perfect for the new blogger. They offer just about anything and they are very well known and trusted throughout the world. Commissions are on the lower end but the ease of use makes it a quick way to recommend products to your readers. Once you find a product or company you want to promote you first need to apply or email the owner of the product asking them if you can be an affiliate. Once you are approved you will be given a unique link that is your identification. Each link has a cookie and the length of the cookie depends on the program. A cookie is a tracking link that is stored in the browser within a text file. Each cookie is a different length. From 1 day to lifelong. It all depends on the program owner and how they have it set up. The longer the cookie is the better for you. If you know what you are doing, affiliate marketing can be a great way to make some serious money with your blog. Unfortunately, many people stick a few Amazon links into a blog post and call it a day. Then after getting little to no action on their links, in turn making no money whatsoever, they throw up their hands in frustration and walk away. Ha, I was this exact person. So I know a little of what I am talking about. How did I turn it around? A friend of mine told me about a course that would show me how to do affiliates the right way and finally make some bank. Making Sense Of Affiliate Marketing by Michelle Schroeder-Gardner is really what turned everything around for me. No lie kids. Before Michelle? Broke After Michelle? Not broke. Any questions?? This self-paced online course is an in-depth step by step guide on how to make money. I highly recommend it if you are serious about earning a living through blogging. I went from making $10 – $15 each month with Amazon to making HUNDREDS every month. Moneymaker #3 Writing reviews for companies or products. I love this way of making money. It is an easy to do and a fast money maker, especially during the holidays. My favorite way to do a review is a gift guide. A gift guide is simply a post that you write listing recommendations for a certain genre or recipient. You can then fill the post with links to products on the list. You can then fill the post with links to products on the list. As many as you want. No worry of turning readers away. Well, if a person seeks out your list they are specifically looking for gift ideas. This means they are itching to click and buy. So, fill that list up with as many links as you can find! Actually the more the better, just make sure you stay on point for your specific list. No other time is better for this than the holidays. For that reason, it is important to get your guides written and up early before the market gets saturated. I would suggest writing your gift guides 4 months prior to a holiday and have it live at least 2 1/2- 3 months prior. This will give you enough time to gain a little traction in social media. I could go on and on. But you can see the sky is the limit with these! Check out my gift guides here for even more inspiration! Tip: Change images to match the season. Every year my Stocking Stuffer Gift Guide For Guys makes me a good chunk of money for the holidays. My image is, of course, a Christmas one. I also have a generic image for this guide. Now I have a guide of gift ideas for guys that people can look at for Birthdays and other occasions! You can also approach companies to do reviews of their products specifically for them. Your best way to do this is to email or call the company and ask them if this is something they do. If they do not compensate they may give you a discount or the actual product itself. Prior to approaching a company, you will want to have a media kit in place. This will make giving your stats and other information much easier and quicker to do. You can see how to create a media kit here. Another variation of this is a sponsored post. A sponsored post is when a company pays you specifically to write an entire blog post about their product. You can make some good money doing this. The important thing is to only write about products that are relevant to your blog. Also, not all companies do sponsor posts so contact them to see if this is something they offer. Moneymaker #4 Selling your own products or services. Now we are about to talk about my biggest mistake and my favorite thing all rolled into one! I did not start to make good money, money I am actually excited to tell other about until I create my very own products to sell on my blog. If you learn anything from this post, learn this. NO MATTER HOW NEW YOUR BLOG IS RIGHT NOW, START MAKING PRODUCTS TO SELL. THIS IS BY FAR THE BEST WAY TO MAKE MONEY BLOGGING! Selling your own products is not only rewarding but a great way to make some serious money with your blog. The trick is to create something your reader “needs”. No, scratch that. The trick is figuring out what your reader needs, then create it. The best way to do this is to literally put yourself in your reader’s shoes and think what they would want to make their life easier. It doesn’t have to be a product. A class, a private group, an e-book, a challenge, an e-course, even a printable or cheat sheet. There are quite a few options out there. Are you a food blogger? Then you could write a cookbook. Are you a homeschooling blogger? Then you could create printable worksheets for kids. Are you a travel blogger? Printable luggage I.D. tags might be something you could sell. Do you write about gardening? A printable journal may be what your readers are looking for. Do you blog about blogging? Then creating an amazing planner is a good idea. When it comes to creating a product of your own, you really need to do a little investigating to figure out what will work best. You need to know your readers, gain their trust, then create an item that they need or want. Yep, it really is that simple! Once you have a product made you will want to get a shop option on your blog and set up a commerce site to accept payments. I use Woocommerce, which you can get a free version and is a good place to start out. I also use SendOwl to house my digital products which are sent automatically when a customer purchases. As with anything in blogging, education is key. Do your research, try things out, and be willing to go back to the drawing board if the success isn’t quite what you wanted. 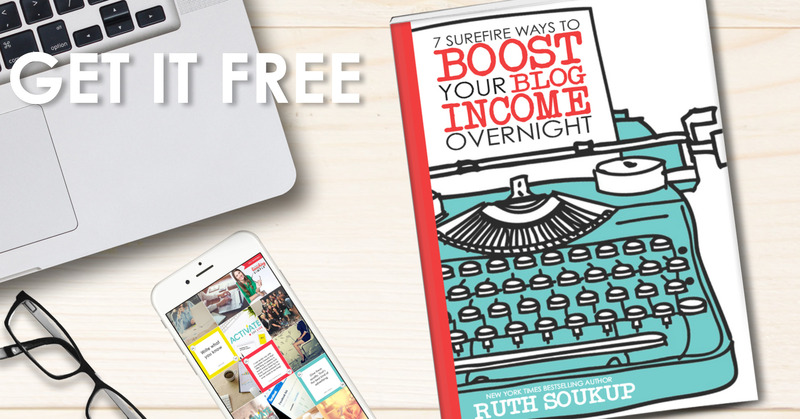 If you are new to blogging and need a lot more help than this blog post can give, please check out this awesome freebie that can get you on the right path to a money making blog. Elite Blog Academy is the ONLY reason I have a blog today and it wouldn’t be fair to you (or them) not to give them a shout out. Doors open only open once a year so grab your freebie and get your name on their wait list. Not only will you get a heads up when their doors do open but you will get access to even more freebies all meant to teach you how to have a successful blog! More blogging resources to check out! « Middle Aged Blogging – How To Make It In A Young Person’s World.